I made another evening visit to the Marshfield area in search of Quail. Despite stopping at favoured locations from previous years there was no sound. It seems that this is not a good year for Quail. The mid summer doldrums have arrived and there are no new birds to see at the moment. I went for an evening stroll along the sea wall at Severn Beach this evening. I had seen a Common Scoter from my bedroom window 3 hours earlier but the tide and wind had now dropped so I didn’t really expect to see anything and I left my camera at home. This seems to guarantee some good sightings. After walking 100 yards, a Hobby flew along the seawall in pursuit of the local House Martins. Two hundred yard further along I saw a Storm Petrel floating on the river below us. To my surprise it flew, gained height and flew towards us along the footpath on top of the sea defences. It then flew around the the grassed area over dog walkers heads for a 30 seconds before flying off back to towards the shingle beach and the falling tide. No new birds for the year today but more enjoyable than the football. 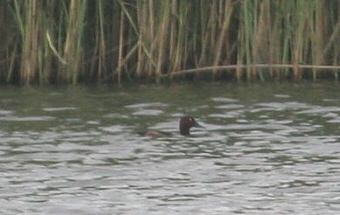 The elusive drake Ferruginous Duck allowed me to take a distant record shot today. It showed for a five minutes but soon disappeared again into dense cover. I took an afternoons leave today to look for a Ferruginous Duck. I was lucky to see a handsome drake swim out of cover within 10 minutes of arriving at the site. A Shelduck didn’t take too kindly to the bird and after 30 seconds of being on view it was chased back into the poolside vegetation. I waited another two and a half hours for an attempt at taking a picture before giving up. I will have another attempt later in the week. I spent the morning at Chew Valley Lake today in search of some late spring rarities but had to be content with just the change in scenery. I heard a Cuckoo near the reeds off Herriott’s bridge, only my third this year but missed a Long-eared Owl by a few minutes. The Owl was a Chew rarity, only the 5th record and the first since 1989. 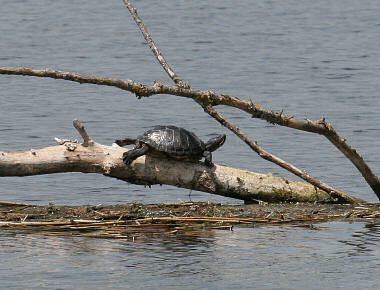 A Terrapin spent the whole time I was there making the most of the hot weather, sunning itself on a fallen tree off Herriott’s bridge. A hot day (29°C) with a South East wind. A typical early June day with a small number of late spring waders this morning, the best of which were 2 Sanderling. The rest of the day was quiet with a family barbeque and several world cup football matches to watch. At 7 PM I decided to walk the 100 metres from home at Severn Beach, to see if anything else had come in on the evening tide. I wasn’t optimistic and I didn’t take my camera. 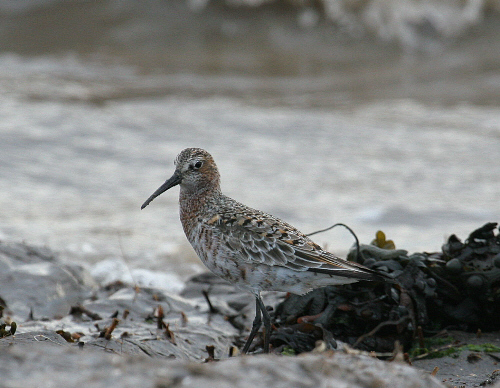 To my pleasant surprise the first bird I saw was a Curlew Sandpiper with just 3 Dunlin and 2 Ringed Plover. I quickly telephoned home and asked my wife to join me with my camera bag and was lucky to obtain some decent images as the small group of waders fed on the tide line. The 3rd Avon record of Common Rosefinch was found this morning at Sand Point. Due to work commitments I was unable to get there today. Hopefully this was not the only rarity to be found this month. This was always going to be a quiet month for finding new birds for the year. I only expect to add one or two species in the whole month but June can always produce a surprise bird. Avon rarities that I have recorded in previous Junes include Little Bittern (1993), Great White Egret (2003), Corncrake (1989), Black-winged Pratincole (1988), Bee-eater (2002) and Montagu’s Harrier (2005) so there is something to look forward to seeing other than the football World Cup. 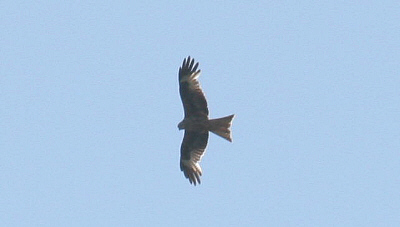 I was lucky to find a Red Kite this morning as it drifted off East over Northwick Warth, only the second Severnside record following one in March 2005.